The “hub” for chocolate on the west side of LA! Let’s dig into how chocolate is grown! 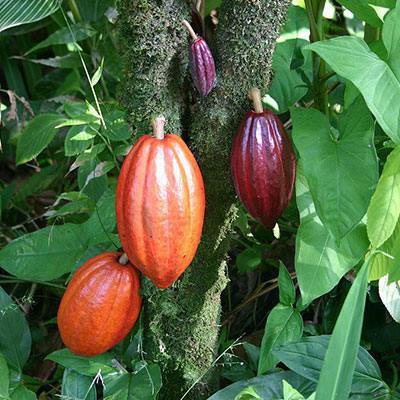 For starters, chocolate, or cacao, begins its life on a farm. 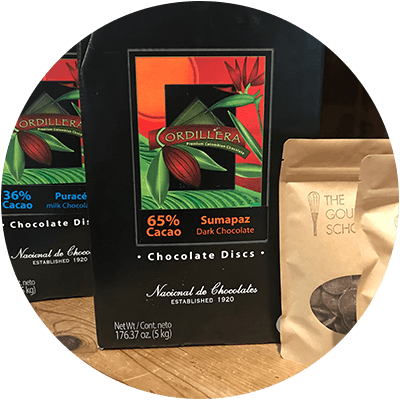 The Theobroma Cacao tree grows 20˚ North and 20˚ South of the Equator and spread from its origins in the area that is now Mexico to colonized states around the world during the 16th century. Chocolate is made from the seeds of a fruit that grows inside of football-shaped cacao pods. These pods sprout from the branches and the trunks of the trees and are harvested with a machete. Once cut open, each pod reveals about 3 dozen seeds, arranged in a tubular pattern, resembling something like an ear of corn. Once harvested, the first part of flavor-developing process begins. Inside the pods, each bean is coated with a white albumen, a sort of silky white pulp that varies in flavor from floral to mildly citrusy. The beans and the sweet pulp surrounding them are piled into wooden boxes, often covered with banana leaves, where the sugary pulp begins to ferment the beans. This chemical process heats the beans, develops flavor and kills harmful bacteria. Once the beans are fermented and the pulp is sloughed off, they are dried in the sun and placed in large sacks, waiting to be shipped to chocolate makers. A chocolate maker will take beans from a wholesaler (or directly from a farmer should the chocolate be designated as Direct Trade) and turn cacao in chocolate using a few processes. The beans must first be roasted in order to separate the thin shell from the bean. The beans are then cracked and tumbled in a winnowing machine, which shakes off the shell particles and separates them from the beans. The husks are thrown or away (or sometimes used as mulch!). The beans, now largely broken up into tiny cocoa nibs, are then ground down into a thick paste. The paste is further processed using a variety of different machines. Some chocolate makers use steel rollers, some use a ball mill and others use stones. This friction, also known as conching, grinds the beans further to reduce acidity and off-notes in chocolate and to form a smoother paste known as chocolate liquor (having nothing to do with alcohol). Chocolate liquor is the base for all chocolate. The percentage of any chocolate is determined by the amount of cocoa bean used and includes any additional cocoa butter. The percentage does not include other ingredients, such as sugar, vanilla and stabilizers like soy lecithin. Extracting cocoa butter reveals a surprising fact about cocoa beans; depending on the varietal, each bean contains approximately 50% fat, some with a little more, some a little less. Once the beans are processed into chocolate liquor, the cocoa butter can be squeezed out of the liquor by a hydraulic press to extract the fat- or cocoa butter- leaving behind only solids which are called a cocoa cake. Those solids become cocoa powder. An alkalizing agent is added to the powder to create “Dutch-processed” cocoa powder, making it more stable to work with in recipes that call for baking soda. The cocoa butter that is removed can then be sold to cosmetic companies to add to their products or made into white chocolate (which must legally contains 32% cocoa butter). The rest of white chocolate is made up of sugar, dry milk powder, vanilla and an emulsifier like soy lecithin. Large scale companies, like Hershey’s, Nestle, Cadbury, Lindt, Mars and Callebaut, to name a few, purchase bulk or commodity beans. Commodity beans, or cacao futures, are bought and sold much like corn, soy and wheat on the stock exchange, with farmers’ earnings dependent on the strength of these market forces. Farmers in West Africa, for example, whose beans may exchange hands up to 22 times before reaching the customer and are dependent on market prices, may get paid less than $1.25 US per day for their beans. The beans exchanged on this market are rarely high quality. There is a great divide between the grower and the chocolate maker here; most of these beans will be used in candy-like chocolates derived from poor quality beans with off flavors and processes masked by loads of sugar and vanillin. Candy bars, chocolate chips and cheaper baking chocolates produced by these large and powerful entities are more candy than chocolate; many contain as little as 11% cocoa solids and contain ingredients ranging from vanillin (a vanilla-like flavor derived from wood pulp with chemicals), PGPR and GMO Soy Lecithin. The large majority of chocolatiers and pastry chefs are not chocolate makers but use high quality couverture chocolate to melt down, temper and then coat their confections or bake into brownies, cookies, cakes and fold into mousses. Couverture means a cover or blanket in French; these chocolates are formulated with a touch more cocoa butter to melt more evenly and smoothly, creating a thin, even coating for truffles and chocolate coated candies and to melt more easily. This sort of chocolate is what you’re looking to purchase when baking anything from cakes to tempering chocolate for truffles and bon bons. Couverture chocolate is usually purchased in bulk blocks or smaller pieces and are designed to temper well, but may not be as transparent as some chocolatiers and pastry chefs like. As more chefs become increasingly aware of labor practices and GMO lecithin, they are demanding more transparency from their chocolate makers. The rise of the craft chocolate movement has opened our palates to the great variety of beans and the art and skill of proper fermentation and processing of the beans with the same fervor relegated to vintners. These two-ingredients chocolates typically contain only cocoa beans and sugar, allowing the consumer to discover the difference between fruity beans from Madagascar and the deep, earthy notes of Trinidadian cacao. The chocolate makers producing these bars usually practice direct trade and work alongside the farmers to ensure that the beans are fermented and dried to their specifications. Craft chocolate makers who work directly with cacao farmers also eliminate many of the middlemen, thereby increasing the wages for the farmers. Bean to bar crafters are chocolate makers. They roast, winnow, grind, conch and temper the beans and make single-origin bars for consumers to experience the differences between beans made from different countries, farms and growers. Some of the craft chocolate makers will stud other ingredients that complement the varietal, from dried figs to sea salt, to make inclusion bars. New craft makers are popping up all the time (see our list of favorite bean to bar makers and where to purchase them). If you are unsure about what chocolate to buy, the best thing to do is read the package, look at the ingredients and read the “story” of the chocolate maker and the beans that they purchase. You will also find that the employees in most of the gourmet stores that carry these bars are very knowledgeable about these products, so feel free to ask them. Ruth Kennison studied the art of being a chocolatier at The French Pastry School, the Callebaut Chocolate Academy, as well under M.O.F. Stephane Treand. Her infatuation with chocolate began with her first job in high school at a prominent sweets shop in Boston, where she grew up. Since then, Ruth has followed her dessert passions around the world – taste-tasting vanilla beans in Tahiti, selling homemade madeleines in Sydney, honing her chocolate skills in Asia alongside a former pastry chef from Spain’s El Bulli Restaurant and with chocolate greats in Paris. Most recently, Ruth has been traveling around the “chocolate belt” of the equator learning as much as she can about where our beautiful chocolate comes from. Ruth has a passion for educating both children and adults about every aspect of the cocoa bean. Ruth launched her own chocolate company and website called Bonaparte Chocolate and she insists that all her new concoctions be tested by her husband, David, and son, Sebastian. 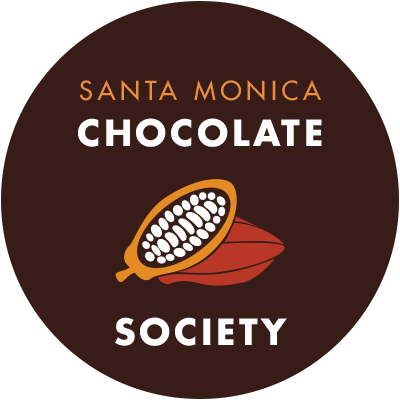 The Santa Monica Chocolate Society is a club of sorts that celebrates and savors the finest, rarest, most delicious chocolates on Earth. 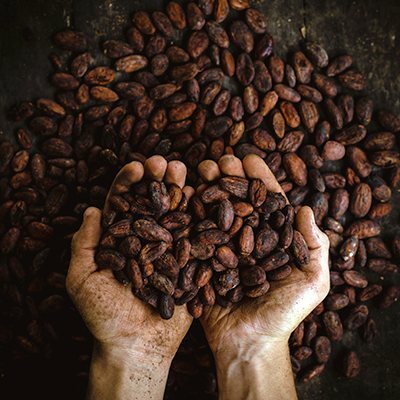 We gather on the first Thursday of each month to taste regional bean-to-bar chocolates and meet, often with a guest speaker, ranging from cacao farmers to the craft chocolate makers themselves. It's time to get your Willy Wonka on! Chocolatier and renowed chocolate expert Ruth Kenninson will take you through a chocolate tasting, then have you tempering using the Tabling, Seeding and Direct methods. Each student will leave with an impressive array of handmade chocolates. Cacao is grown 10-20 degrees north and south of the Equator. Traditionally, countries that grew cacao did not produce chocolate, and there are many reasons for that, ranging from environmental factors to geopolitics. Countries that grow cacao are now, thanks to direct trade and the growth of the craft chocolate movement, producing some of the most interesting single-origin chocolate on the market. This is good news for chocolate lovers but, more importantly, for the local growers and suppliers in their respective regions. Find out why and how delicious chocolate made in the countries they are grown in can taste! 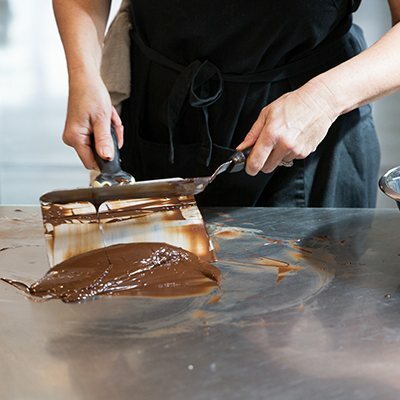 Join Chocolatier Ruth Kennison for an 9-hour workshop that will have you tempering, rolling, caramelizing, dipping and enrobing a variety of handmade chocolates. Students will make caramels, prepare ganache, temper chocolate and enrobe by hand. 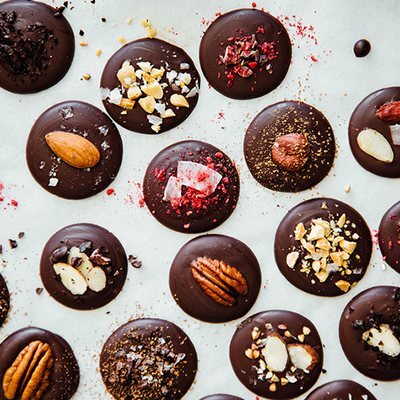 You will be coloring cocoa butter, caramelizing hazelnuts and perfecting confections with seasonal ingredients from the Santa Monica Farmers Market. The Gourmandise School sells milk and dark specialty chocolate from Cordillera. You can buy them in the following quantities in-store, or we can ship them to you. Visit or shop at the school, or give us a call at (310) 656-8800 to order.